I am a big fan of candles and wax tart burners as a way to fragrance my home and have heard of Scentsy because a friend of mine in Canada is one of their consultants. I wasn't aware that the company's products were available in this country until I was contacted by a Scentsy consultant, Heather Budd, on Twitter, asking if I would like to review her products. The basic premise of Scentsy is that they offer wickless candles. These aren't so much candles as blocks of wax which you place into the dish of a warmer which you plug into the mains. The warmer has a lightbulb in it which gradually warms a plate underneath the dish and causes the wax to melt and release the fragrance.If you are familiar with burning wax tarts it is a similar process except there is no candle, and therefore no naked flame involved. The warmers come in two sizes - full size and mid-size. I was sent the Delta Full Size Warmer and a selection of three wax fragrances to review. I found the warmer really easy to set up, you simply unpackage it and fit the dish on top of the main warmer body. It plugs in to the wall using an adapter, which shows the company's North American roots. The warmer I was sent was quite a neutral design, as shown, I thought it was quite funky but also that it would go with a lot of different decor. There are holes pierced around the widest part of the warmer which allows you to see the light from the bulb shining through, and gives a similar effect to having a candle lit inside there. This photo doesn't really do justice to the burner or the light which shines from it. It really does look lovely. I was sent three different wax cubes to try. Christmas Cottage - a blend of Valencia oranges, raspberries, cloves, and spices. Pumpkin Roll - Creamy pumpkin pie filling surrounded with yellow cake, pecans, butter, and spice and Central Park Pralines - A decadent confection of rich roasted pecans, buttery caramel, and cinnamon sugar. These all form part of the Autumn Winter Collection. My favourite was the Christmas Cottage,I thought it smelled just like Mulled Wine. The wax cubes were broken off from a larger bar which looks rather like a small ice cube tray. The fragrance was really strong and long lasting but not overpowering. Each cube lasted for around 8 hours of warming. I found the warmer really easy to use and the fragrances to be great quality and definitely the sort of fragrances I would choose myself. I do like spicy and food-y scents The warmers sell for £30 for the full size warmer, and £25 for the mid-size warmers. This is a little expensive but they are great quality. The wax bars sell for £5 each and each offers 6 chunks - by my reckoning about 50 hours of home fragrance - so comparable with the prices of wax tarts and candles. One thing that I really loved is that there is no waste with the wax here. You don't get that annoying bit of the candle that doesn't melt. When the fragrance is gone you simply pour the used wax away (I just used an empty can but the recommendation is, when you have a bar in it's packaging, to pour it back into the packet) and then wipe the dish to remove any residue. This was so much quicker than having to put a burner in the freezer to unfreeze a melted wax tart! The products are quite expensive but, if you enjoy experimenting with this type of product I think you would find them great. There are 80 different fragrances available so I am sure everyone could find the scent that suits them best. 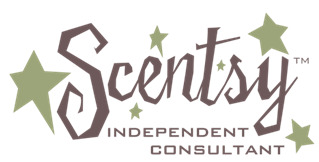 Scentsy sell online through independent consultants like Heather Budd, and also have in-home parties (similar to those hosted by The Body Shop or Pampered Chef). If you would like any information about their products please contact her.